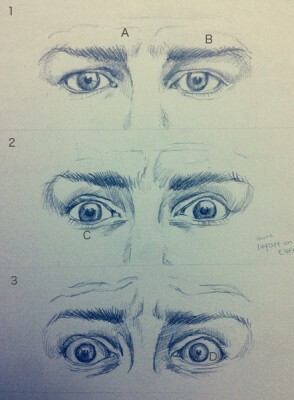 a sneak peeks of some upper lower limitation of eyelid, anger and fear. 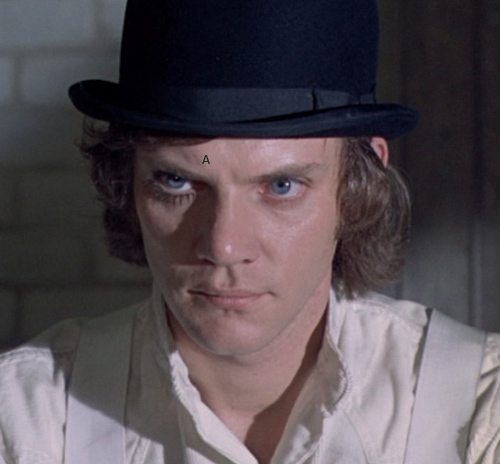 There is a reason why Malcolm McDowell was a perfect choice for the role of Alexander DeLarge in Stanley Kubrick’s 1971 dystopian crime movie, Clockwork Orange. In this movie, the character of Alex is violent and evil, and at the same time, he keeps showing a side of mischievous-boy-like charm on his face during the film. The Human being basically has only 6 main expressions, though over 7000 different types of facial expressions can be created with them. When those emotions are mixed, a very attractive look (in both a positive and negative way) could be created. For example, the “Stifled Evil Smile”. 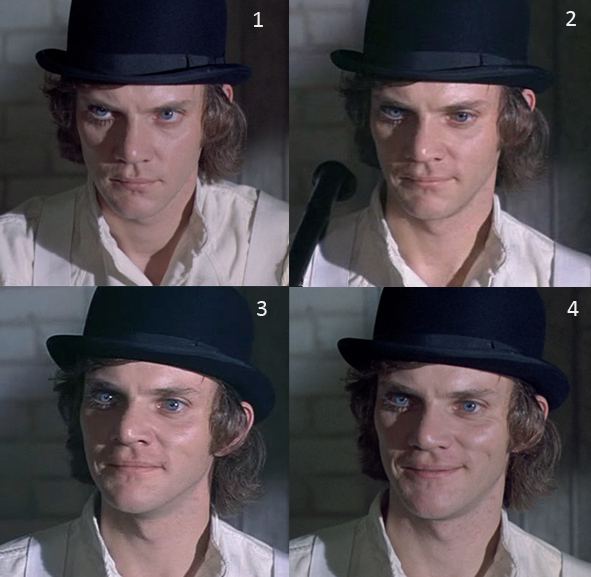 The interest thing is that Malcolm McDowell originally has a unique face, but his mysterious acting with mixed emotions allows releasing his subtle charm even more. 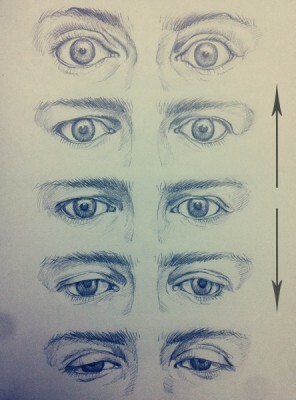 Knowing the subtle movement of face muscles will help artists when they draw, paint, or sculpt the portraits. 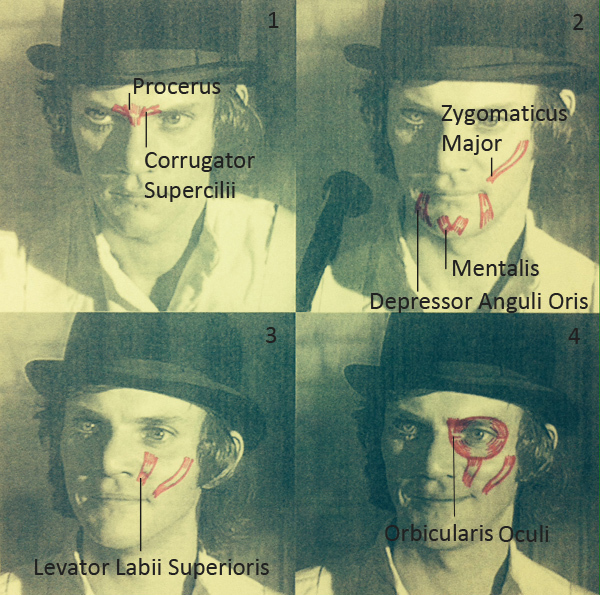 Here is the description of how his facial muscles work. This is a scene from the movie when Alex’s 3 droogs come and met him in the lobby of his apartment. Procerus muscle is located in between the eyebrows, and it shapes like an upside-down triangle. 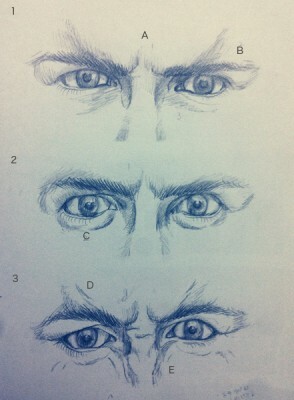 The function of this muscle is to lower brows, and this creates a discontent face. 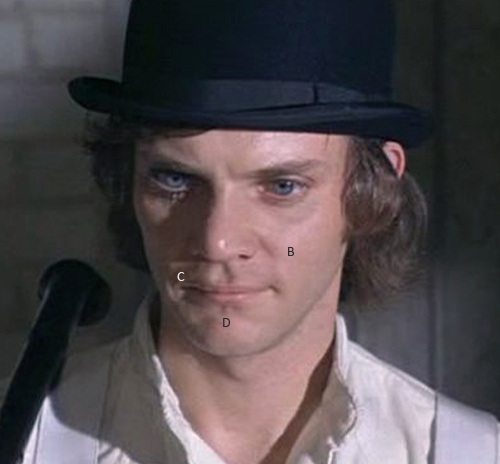 In this picture, we can see a projection (A) coming down towards the middle of his eyebrows. Also, Orrugator Spercilii, which is located on the sides of Procerus helps creating the disgust face. However, it seems like Orrugator Spercilii has not fully been contracted yet. Procerus is still down, and now the signature smile slowly has been shown. This is his “Stifled Smile”. The ‘smiley’ muscle, Zygomaticus Major contracts and creates a small projection on his cheek (B). A smile is supposed to rise the corner of the mouth, but the right corner of his mouth looks like it goes down (C). This means that Depressor Anguli Oris tries to kill the smile and yanks down the corner of the mouth. Mentalis also works and push up the lower lip. A little bit of tensity can be seen (D). When these 3 muscles work at the same time, it creates the “Stifled Smile”. Here, Zygomaticus Major contracts even more. The projection on his cheek became bigger and the small dimple is created (E). This picture can describe Alex’s evil side because Levator Labii Superioris muscle finally started working. This muscle connects Orbicularis Oculi (surrounds the eye) and Orbicularis Oris (surrounds the mouth), and it pushes and rises the upper lip to create disgust emotion. It is hard to see but it makes the skin tense (F) and makes him have a sinister face. At this stage, the picture contains many mixed emotions, and this might be the most interesting face of all the pictures. At last, the original smile has been seen. Orbicularis Oculi contracts and some small wrinkles have been created underneath his eye (G). Also, the corner of his mouth naturally rises up (H1) and makes a regular smile. 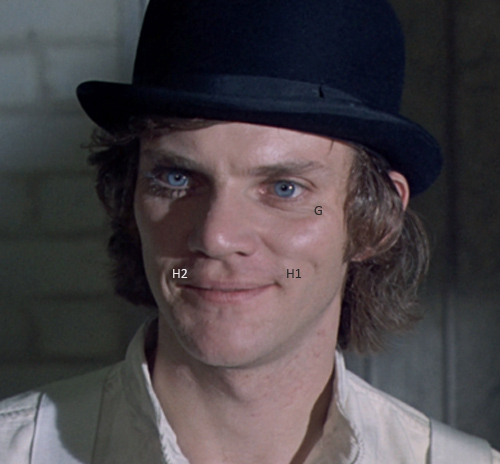 Although, his brows are still down, the other corner of his mouth is not rising up evenly (H2), so it shows that he still has an unknown and mysterious “Stifled Evil Smile”. It is not easy to control the different types of emotions at the same time on our faces. However, because it is not easily shown, these unknown expressions can attract people. 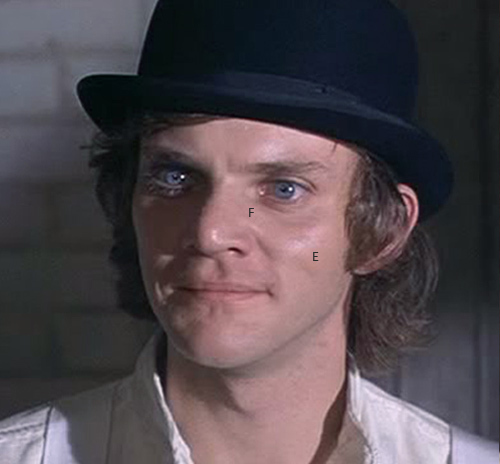 Alex’s stifled evil smile is a great example, and Clockwork Orange could not be the movie we know today without him.